Feeling Nostalgic about Safeway? Yes, Safeway. The most recent flyers at Safeway say the pharmacy store is closing tomorrow, Tuesday, February 27. The store closes March 10. It’s not until I saw the mostly bare shelves last night that I began to feel nostalgic. Last Tuesday I lucked out walking in when the wine and liquor liquidation party got started (pre-mom Pink would approve). It was an epic, jovial party, one that will fuel local parties for some time to come! Perhaps I’ll feel a tinge of regret each time I lift a glass– at 50% off, my “cellar” can fill a lot of glasses. 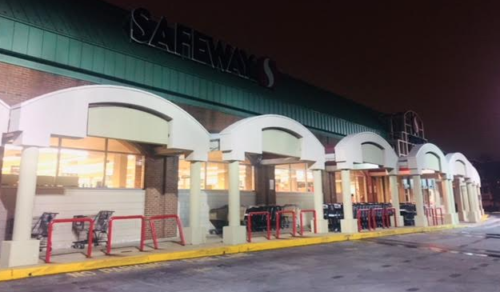 Living less than a block from the store for over 20 years has given me the long view of the “Safeway experience.” The local foot traffic the store generates was one of the reasons I bought my house just down the street. For a long time, the store really did feel like the “UnSafeway” but it was certainly better than the “Soviet Safeway” in Dupont Circle. As time went on, the lighting improved and stock on the shelves became more diverse. The day I found mascarpone cheese and Tuscan pistachio gelato I knew our Hill East store had truly jumped the shark. The source of my best memories — and most bleary-eyed ones — is from early morning visits three to four mornings a week from 2012 to 2014. My son didn’t sleep past 5 a.m. for YEARS. Hoping to keep from him from waking the rest of the house I would bundle us up and walk to Safeway, grateful there was someplace to go, keep warm, and help me feel like I had accomplished something by 6:30 a.m. You wouldn’t know the staffers got up earlier than I did, judging by the warmth and friendliness that always greeted me when I arrived at Safeway. Each time I see Ms. Nita, I think of those days where she’d check me out, compliment the baby and tell me about cooking for her grandkids. I will miss the gentleman in the produce section who would dig through boxes of arugula to help me find the freshest box. I will miss the customer service rep who happily gave me rainchecks when the Annie’s White Cheddar Macaroni & Cheese went on sale. I look forward to seeing which ones return when the new store reopens in 2020 (hopefully! ), and hope Safeway is good to them during the transition. In the meantime, my now-five year old and I hope Harris Teeter steps ups its donut game.